Motorola Moto X Force review | What Hi-Fi? Accidents happen. It’s inevitable. That’s why we love it when manufacturers not only keep that in mind, but also show off how much they’ve kept that in mind. 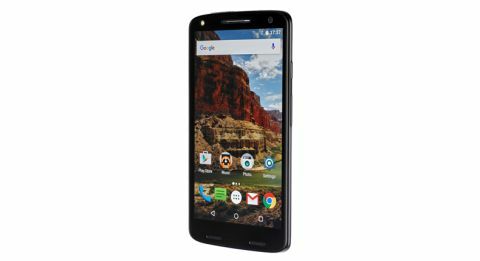 Take the Motorola Moto X Force, so named presumably because it requires a significant amount of force to break it. Motorola is so confident you won’t be able to break its screen that it guarantees it against cracking and shattering for four years – under typical use, of course. That means don’t beat it with crowbars, but the occasional pavement slam should be fine. That ruggedness is down to Motorola’s ‘ShatterShield’ technology, a display comprising five layers (instead of the typical three). Right at the top is a sheet of hardened plastic, which protects against scratches and bumps. Beneath that is glass. Next down is the touch-sensitive layer, which feels the prod of your fingertips. This is actually a dual touch layer – if an impact damages the first, a second layer manages touchscreen performance. Underneath that is an AMOLED panel with a resolution of 2560x1440, also known as Quad HD. And, finally, an aluminium chassis holds it all together. The plastic layer is user-replaceable, so you could get rid of minor damage yourself. We’re big fans of this development, especially if it means that watching films with cracked or chipped screens can be a thing of the past. This is on top of Motorola’s typically extraordinary approach to building phones. The metal frame is a good start, but the option to customise the rest is something special. The Moto Maker website lets you choose a phone back made of tough fabric (‘ballistic nylon’), soft-touch plastic, or leather. It also lets you upgrade the internal storage from the standard 32GB to 64GB. It’s not entirely necessary, however, because the Moto X Force has what is increasingly rare in the world of premium smartphones: expandable memory. The SIM tray has a secondary slot for microSD cards up to 2TB, so you won’t run out of films any time soon. To go with its extensive storage capabilities, the Moto X Force has a powerful 3760mAh battery. We played a 720p video on loop for 15 hours and 30 minutes before it gave out. Under more practical conditions, we managed to make it last two days. The battery also benefits from an updated version of Motorola’s TurboPower charging. We went from zero to 20 per cent charge in 10 minutes, and just over 90 per cent in an hour. The phone also offers wireless charging, compatible with QI and PMA type chargers. How does it perform? When it comes to sound and picture, we’d file this under ‘almost there’. There’s much to like, but there are also flaws. We’ll start with the picture, which demonstrates the typical strengths and weaknesses we’ve seen in phones with AMOLED screens. Contrast is lovely. It’s a more dramatic look than the display of an iPhone 6S, with livelier colours, brighter whites and darker blacks. We all want vibrant colours, but the Moto X Force overdoes it a little and ends up looking not entirely realistic. Sometimes the skies are a little too blue, or street lamps too yellow. Then there’s the slight green tint, most noticeable when it prevents whites from achieving that fresh-snow purity. However, we are impressed by the clarity of the screen. It may be overkill for a 5.4in screen to have QHD resolution or a pixel density of 540 pixels per inch, but the image is about as sharp as you’ll get on a smartphone. Sound is also good, but not truly great. There’s clarity and organisation – it’s easy to make out the various textures and vocals, and they’re not all crammed in there. It is powerful and articulate enough to handle the dynamic shifts of Ennio Morricone’s The Hateful Eight soundtrack. Tonal balance is fine, although the midrange feels a little too keen. Timing could also be a little tighter – we still prefer the iPhone 6S’s rhythmic agility and snap. The camera is another impressive area let down by flaws. The 21MP sensor has plenty going for it in good lighting conditions. Images are sharp and colours are natural. The default camera software lets you set separate focus and exposure settings, which is nice. We could do with optical image stabilisation, however. Without this, it is much harder to achieve sharp images in low light. The f/2 lens is fine most of the time, but you struggle to capture details in the dark. Overall it is a fine camera, but beaten by those on the LG G4 and Samsung Galaxy S6 Edge. One area of operation that doesn’t disappoint is the operating system. The Moto X Force ships with Android 5.1 Lollipop, driven by Qualcomm’s 2.0GHz octa-core Snapdragon 810 processor and 3GB of RAM. That means it was already very fast and capable of multitasking without hesitation. Now the Moto X Force can be upgraded to Android 6.0 Marshmallow, which is more efficient, and it positively flies. What you get is a slick experience free from annoying third-party bloatware that can drain your battery or slow down day-to-day operation. This is something new Samsung phones should take note of. Motorola does have a few additions on top of the default Android software, but these are both subtle and quite helpful. For example, the Active Display is a notification screen that activates for a few seconds every time you pick up your phone (or just wave at it) – letting you glimpse key information without unlocking the device. Then there are the gesture-based controls. A quick double-twist of your wrist brings up the camera. Yes please. There’s no doubt about it: Motorola has made its best smartphone yet. Its picture and sound performance could be better, but in almost every other respect this is a remarkable device. It’s powerful, smart and shatterproof – factor in an asking price significantly lower than the flagship competition and you have a force to be reckoned with.